My Fuel injected '89 has both the oil light, and the OP gauge, and now, as well, a mechanical OP gauge. I believe both light and gauge were controlled by the same sender on mine. While my oil light never came on engine running, I was noticing very low oil pressure on the stock gauge at hot idle. I was going to buy a tester, but then saw I could install a mechanical OP gauge for less money. 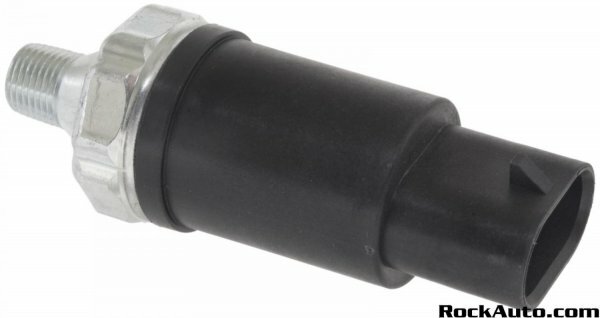 BTW, those Stock fuse holders were so extremely oxidized that recently they were intermittently cutting out on the wiper motor and brake light circuits. The replacement fuse is for the blower motor. It originally burnt out before my ownership, and many aftermarket fuse holders have melted since, but this current 8 awg Maxifuse holder has proven problem free. The fuse is to be 30 amps, but this 20 amp one has not yet blown. Cutting a hole in the dash there was a chore, as one is cutting through metal. Dremel and many a cut off wheel were required. I now have a red LED light in the gauge. It is harder to see the orange needle, but not terribly so. The incandescent bulbs were too bright and distracting. I see RockAuto shows at least 4 different OP senders for an '88 with a 360. The mechanical OP gauge is SOOOOo much better. One can see instant responses in OP with engine rpm. One can determine when the oil is as hot as it normally gets, and this is well behind the coolant temp during warm up, and one can see the differences in different grades of oil and even see lower readings near the end of an oil change interval as the oil shears to a slightly lighter grade or gets diluted with fuel. Before I had a tach, on one X country journey my Lockup torque converter was kicking on and off at highway speeds very quickly and fairly smoothly, and the OP gauge revealed the higher rpms when it would kick out. It was a dirty and improperly adjusted brake light switch causing it to drop out and re engage on road irregularities. My Mechanical OP gauge will read ~68PSI when cold at any rpm. This is the bypass relief setting. When hot the maximum pressure is 62PSI, and that occurs at nearly 3000 RPM with M1 0w-30 AFE oil. 62 PSI occurs at lower RPM's with thicker oils when hot. Whenever the oil pump is in bypass, there is more parasitic drag on the motor than need be. It is not Oil PSI keeping metal parts from grinding against each other, it is the film strength of the oil. The PSI relates to how quickly the oil is pumped through the engine. There is very little correlation between the OEM gauge, and the mechanical gauge. It takes about 45 seconds of the same rpm for the OEM gauge to follow the general pressure, whereas the mechanical gauge responds instantly to engine rpm. The OEm gauge does not swing as wide either, and is a lazy stoned drunk in comparison and just as trustworthy. My Mechanical gauge needle, with hot as it gets 0w-30 oil, will read 14PSI and bounce between 14 and 16 rapidly at 525 rpm. While my OP gauge goes upto 100 PSI, at never sees anything over 70, so that portion of the sweep, and below 10PSI is useless. Mine is a cheapo Equus gauge. Perhaps an Autometer's needle will swing further making it easier to read. Do note that with mechanical OP gauges one is bringing a hollow tube of Hot oil into the back of the gauge and chafing and failure can be messy and dangerous. They give a plastic tube with the cheap gauges. One can use copper tubing instead for more peace of mind. I took extra steps to prevent chafing or kinking of the provided Plastic/Nylon hose in early 07 when I installed mine. Remember that OP is not a more is better thing. It is an ' as long as the minimum recommend PSi is exceeded at such and such and RPM, all is still well' sort of thing. If more OP was better, we should all run 85w-140 gear oil, which is about the thickness of that Lucas Oil stabilizer crap which one should only add when the engine is so worn it can no longer maintain adequate oil pressure with the normal, properly formulated motor oil. Lucas has 0 additives, and dilutes the additives blended into the proper motor oil, and as such should not be used. Lucas also makes some motor oils get all foamy when pumped through the oil pump, and you do not want foamy oil pumped into the bearings. Foamy oil can however absorb sound and make the engine appear quieter, when in fact more engine wear is taking place from a compromised oil film strength because of the aeration. Lucas Oil Stabilizer, the used car salesman's best friend. Well marketed junk. If one desires thicker oil, buy thicker oil, at least this oil will have the proper add pack of detergents, extreme pressure friction modifying and anti wear additives. Sorry for the off topic rant. I'm guessing you got your distributor working well enough that you are confident enough to move on? Reed and 68, that's some great information and definitely something to think about. I really didn't realize the whole oil coming in from a tube deal. Guess I need to read a bunch more before I make my decision. 68, yes... the van is firing up and driving beautifully and we are all ready to hit the road! By the way... question about the gauge that is on the van currently (original gauge)... it has simply L to H with some tick marks in between. Curious, is there any standard for what each tick represents in psi? While it wouldn't be highly accurate it might would at least give me a bit of an idea until I could get all of this sorted which will most likely be a few months or more since we'll be travelin'. Thanks all and I will be back to re-read and contemplate this info once we are packed and cruising. I would not fear the Oil tube for a mechanical OP gauge. You've got enough skills that routing it to be kink and chafe free will not be an issue. My tube is clear, and I can see the oil darken as the mileage on the oil adds up, if I look at where it passes through the firewall grommett. As far as the tick marks on the stock dash gauge, Mine has a range of just over the first hatch mark to just below the One hatch mark above the middle, and the range I've seen is 14PSI lowest and 68 PSI highest( only when cold) according to my real OP gauge. The same rpm has to be held for 45 seconds before the stock gauge reads highest or lowest and relates to the mechanical gauge. Meaning if I were Idling at 525 rpm for 45 seconds hot, the mechanical op gauge would be in the 14 to 16 PSi range and the OEM gauge would read a smidge over the first hash mark. Light goes green and I bring it upto 3000 rpm, the mechanical gauge would go right upto 62 PSI within a second, and 45 seconds later at 3000 rpm the dash gauge would read as high as it ever does, A little bit over half way up the gauge. I think I am still on the original sender though, and perhaps it is lazy/slow. I am not sure how quickly aftermarket electrical oil pressure gauges respond to rpm, faster than the stock gauge, but I do not think they can be as fast as the mechanical gauge. My gauge was 15$ or so and very worth the piece of mind it gave me. I run electric aftermarket oi lpressure gauges since i hate to think about a mechanical oil pressure gaguge springing a leak in my interior while cruising on the highway. Aftermarket electric oil pressure gauge rspond immediately to changes in oil pressure. Stock factory gauges are very slow to respond. I have never found a correlation betwen the lines on the Dodge oil pressure gauge and any specific PSI reading. I have used cheap $20 electric oil pressure gauges that worked fine but in my 89 Ford van I run autometer ultralite gauges. I get them used on eBay when I can find a good deal on them. Large auto parts stores should stock cheap electric gauges. Sweet. Thanks ya'll. We hit the road tomorrow so I'll have plenty of time to think over what kind of gauge I want as we slowly cross the country yet again. By the way, 68, sounds like your oil pressure reads same on the original gauge as ours does. Well, off to pack up and get ready to leave. Re-opening this because.... our stock OP gauge has been reading L or a hair above for a bit now even flying down the highway. So, I finally... (four years after this post) put a cheapo mechanical gauge in today and..... she's reading great in the 60 range when running, 45 - 40 idle operating temperature with the AC on. I'm pretty psyched because that seems good. However, I don't have any actual reference numbers for what she should read as I can't find any in my FSM. But at least she isn't reading 0 which is what the stock gauge would indicate sometimes! Loving that 30 year old oil pump. Looks like excellent oil pressure to me!! Yay Annie!! I know, right, CatFish! We were super psyched. I mean we've always had confidence that we got ourselves a good one but after 30 years there is always that little bit of doubt. So, we were super happy to see those numbers. The small 2 wire sender is for the fuel cut, the larger 1 wire male tab sender is for the gauge, I just did the same thing with my 89 g30, was freaking out about the oil pressure. I had removed the oil cooler because of bad oil lines, instantly turned the oil black in warm weather. Oil gets to hot and I have like 12 # low idle. when warm, 65 plus on cold start.